Posted By:Unknown | At:3:23 PM Be the first to comment! NEW YORK — Dozens of Roman Catholic dioceses, schools and other institutions sued the Obama administration Monday over a government mandate requiring most employers to provide birth control coverage as part of their employee health plans. The lawsuits filed in federal courts around the country represent the largest push against the mandate since President Barack Obama announced the policy in January. Among those suing are the University of Notre Dame, the Archdioceses of Washington, New York and Michigan, and the Catholic University of America. "We have tried negotiation with the administration and legislation with the Congress, and we'll keep at it, but there's still no fix," said New York Cardinal Timothy Dolan, president of the U.S. Conference of Catholic Bishops. "Time is running out, and our valuable ministries and fundamental rights hang in the balance, so we have to resort to the courts now." The U.S. Health and Human Services Department adopted the rule to improve health care for women. Last year, an advisory panel from the Institute of Medicine, which advises the federal government, recommended including birth control on the list of covered services, partly because it promotes maternal and child health by allowing women to space their pregnancies. However, faith leaders from across religious traditions protested, saying the mandate violates religious freedom. The original rule includes a religious exemption that allows houses of worship to opt-out of the mandate, but keeps the requirement in place for religiously affiliated charities. In response to the political furor, Obama offered to soften the rule so that insurers would pay for birth control instead of religious groups. However, the bishops and others have said that the accommodation doesn't go far enough. Health and Human Services spokeswoman Erin Shields said Monday that the department does not comment on pending litigation. Notre Dame's president, the Rev. John Jenkins, said in a statement that the school decided to sue "after much deliberation, discussion and efforts to find a solution acceptable to the various parties." The university argued that the mandate violates religious freedom by requiring many religiously affiliated hospitals, schools and charities to comply. "We do not seek to impose our religious beliefs on others," Jenkins said. "We simply ask that the government not impose its values on the university when those values conflict with our religious teachings." Other religious colleges and institutions have already filed federal suit over the mandate, but observers had been closely watching for Notre Dame's next step. The university, among the best-known Catholic schools in the country, has indicated past willingness to work with President Barack Obama, despite their differences with him on abortion and other issues. 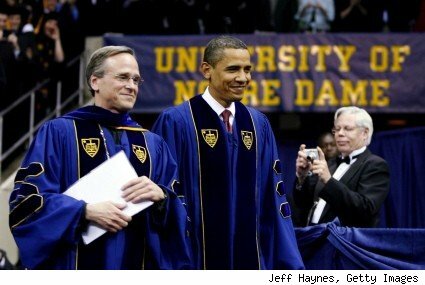 Notre Dame came under unprecedented criticism from U.S. bishops and others in 2009 for inviting Obama, who supports abortion rights, as commencement speaker and presenting him with an honorary law degree.